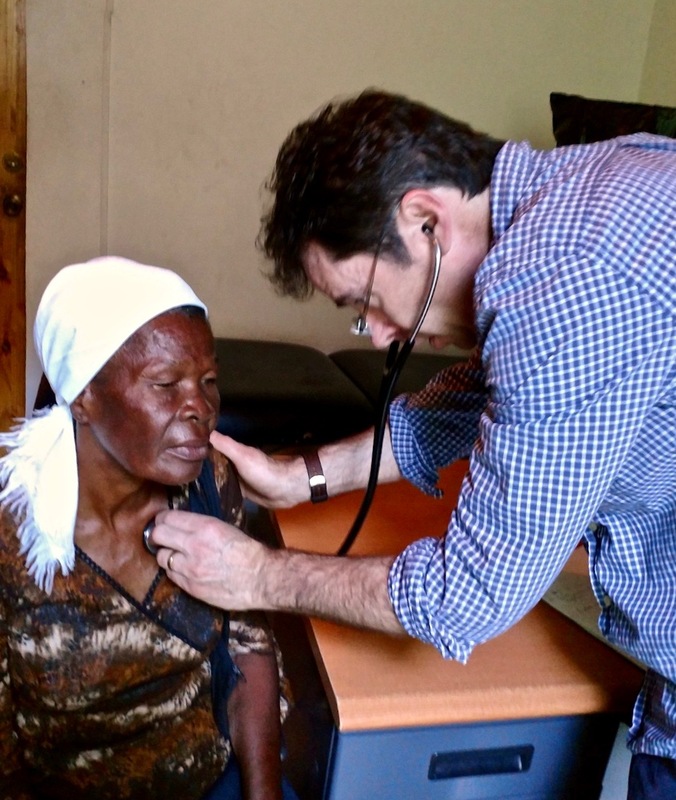 and Dr. Morgan almost overnight found a flight to Haiti and got a cab to the Lamp health center. day has won the respect of the local people for The Lamp, and their full participation in its growth. health workers and other staff - provide primary care and emergency care and health education. with children counting for nearly half. said. Recently, The Lamp had to have a $10,000 drainage canal built and all the labor was local. Lamp also offers tuition sponsorship to more than 30 children. roadblocks have led to abandonment by some foreign aid organizations, workers and volunteers. 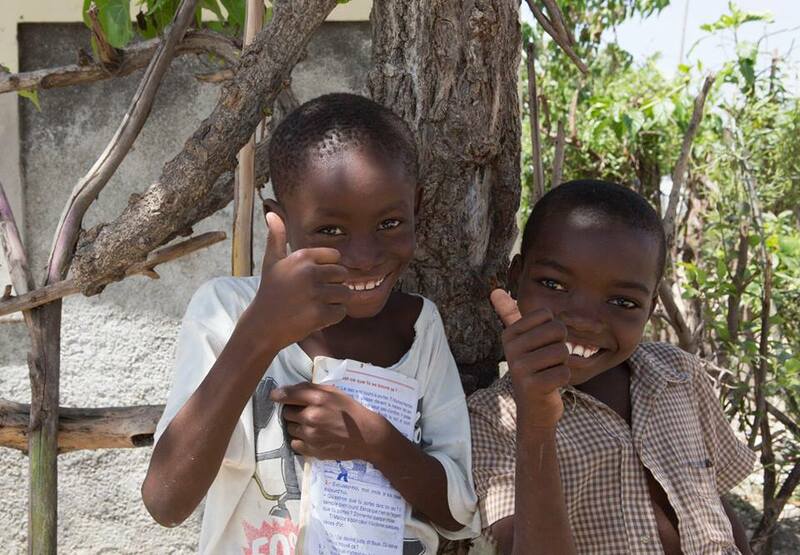 Persistence, expertise and community buy-in are the reasons Lamp for Haiti has succeeded. 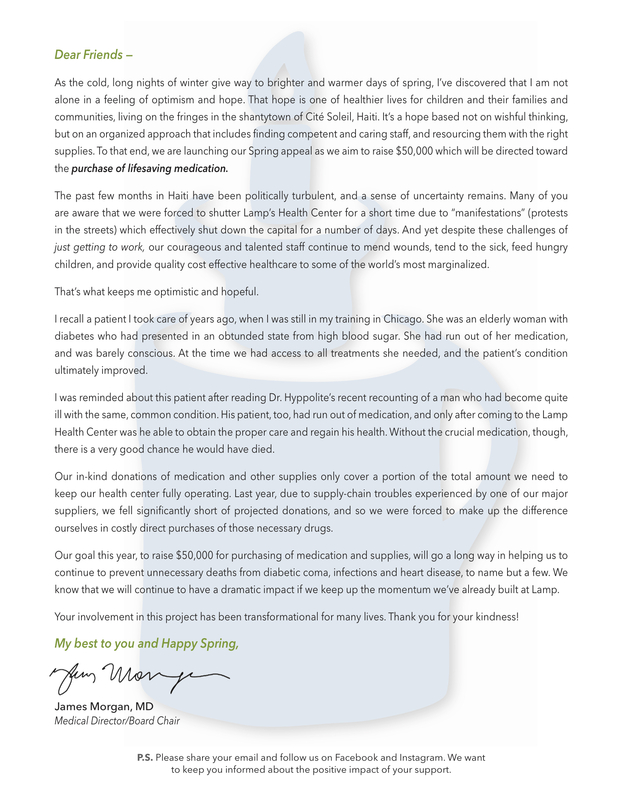 The Spring Campaign is a Success! Our Spring Campaign this year focused on the Lamp’s services for children. Fully one third of all of our patients are six years old or less! 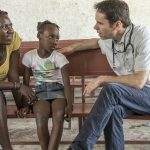 The women’s health clinic is also a key part of the Lamp Health Center and this means that our doctors see a lot of very young infants as well. We will be able to give at least 200 expectant mothers a new infant kit – something we have not done before! We have already given our staff the word to expand our child nutrition program, and will add at least 50 children to that program in the coming months. 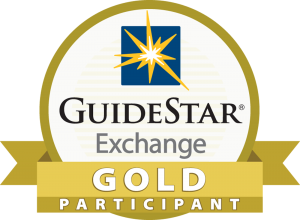 It is a privilege to be able to pass on this great news to our staff in Haiti! Thanks to everyone that participated! The Lamp is always eager to work in partnership with any organization that seeks to improve conditions in Cité Soleil. This principle certainly includes collaboration with the government, both national and local. 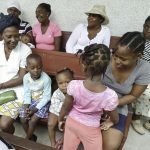 Our recently established Community Health Worker program, for example, takes full advantage of our collaboration with Haiti’s Ministry of Health. 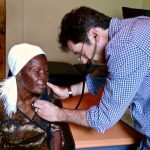 Because of this partnership we are able to put our own staff into the Ministry’s training courses and utilize health education materials that have been developed and approved by the Ministry. Last week we took a new step in this direction. We held our first mobile clinic at City Hall in Cité Soleil. 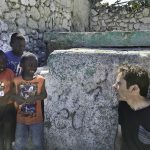 The name Cité Soleil is typically used to denote the huge shanty town on the edge of Port-au-Prince (where the Lamp’s Health Center is located) but it is, in fact, also a “commune” – that is, a municipality with its own mayor. 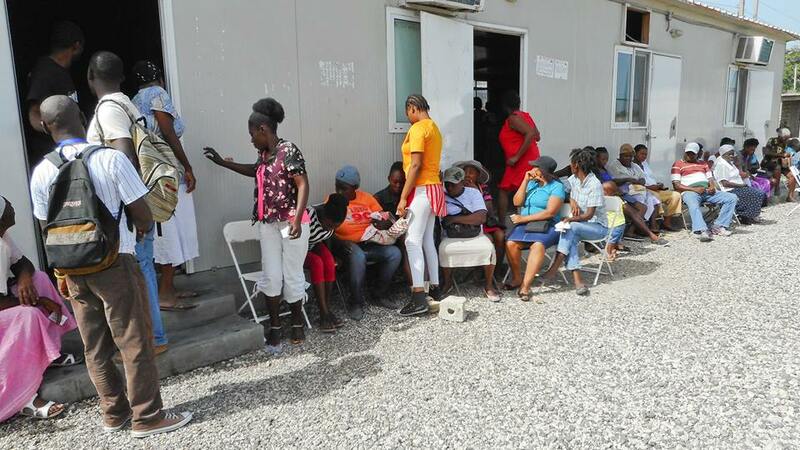 The mobile clinic was organized in direct collaboration with Mayor Huslain Frederick, a politician with a genuine desire to make a positive impact. The joint effort increases the standing of the Lamp in the larger community and allowed us to provide medical services to a whole new population. We will continue to explore this partnership. Despite the normal difficulty of setting up in a new location, Lamp doctors saw 235 people and continue to follow up with those who need ongoing care. “It was a hard and beautiful journey in Cité Soleil” said our Medical Director, Dr. Hyppolite. Thank you for your support. 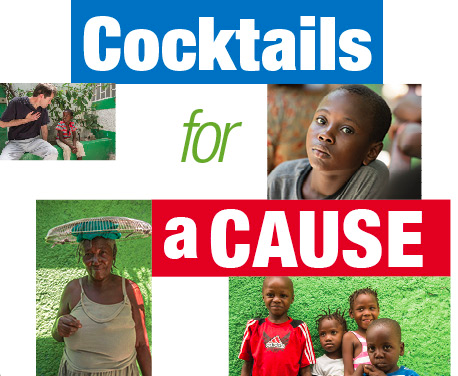 Your financial and promotional contribution to this campaign will help us improve the quality of care for hundreds of residents living in Cite Soleil, Haiti. 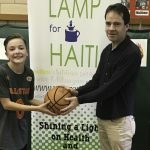 You can donate to Lamp for Haiti’s campaign by clicking on the campaign link on our website at www.Lampforhaiti.org, going directly to https://www.crowdrise.com/thelampfoundationinc, or by going to www.crowdrise.com and typing “LampforHaiti’ or ‘The Lamp Foundation” in the search bar. Scroll to the bottom half of our page and click on ‘JOIN THE TEAM’. This option requires you to sign in using your Facebook page. 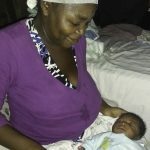 Please Note: Lamp for Haiti will not have access to your Facebook page this way, and CrowdRise does not use your Facebook account to solicit you or post anything on your page, this is just an option to easily sign into CrowdRise. 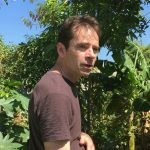 The second option is to sign up for CrowdRise which you can do by providing your name, email address and a password you created. Once you sign up you will be considered a team member of this specific campaign and you can use a photo of yourself to represent your page and write messages to your team. 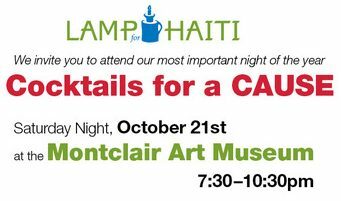 Please Note: If you choose this option, Lamp for Haiti’s description of the campaign will automatically populate onto your page. Go directly to https://www.crowdrise.com/thelampfoundationinc, click the donate button and select the team member you would like to support from the drop down option on the donate page. 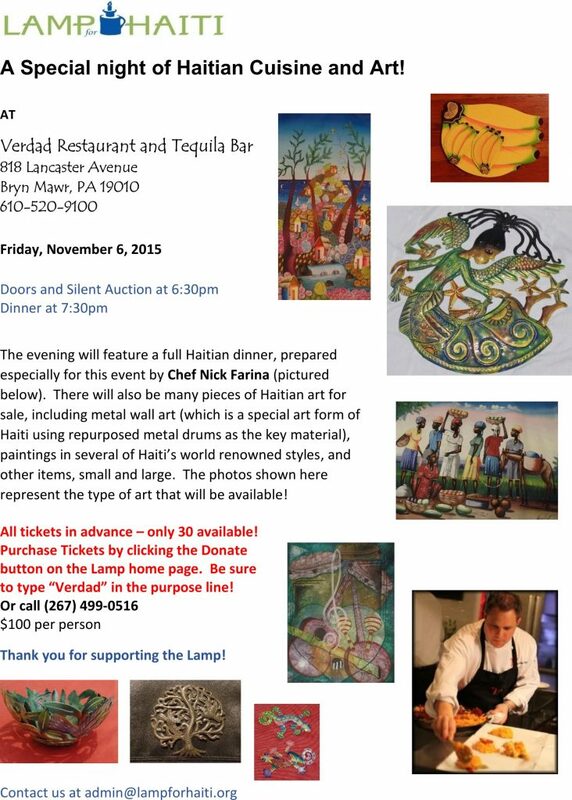 Nov 6 Haitian Dinner in PA – Click here for Ticket Info!